Catholic missionary work began on the first Pentecost Sunday as the first Pope, Saint Peter, inflamed with the gifts and fruits of the Third Person of the Blessed Trinity, God the Holy Ghost, Who had descended upon him and the other Apostles and our dear Most Blessed Mother, preached to the Jews assembled in Jerusalem that day, exhorting them to convert to the true Faith. Three thousand Jews from all over the Mediterranean region converted. Such open "proselytizing," of course, of the Jews is strictly prohibited today by the counterfeit church of conciliarism. Saint Peter went on to become the Bishop of Antioch in Syria before establishing his See in Rome, the seat of the empire of the Caesars that controlled large parts of the known world that time. Saint Peter, along with Saint Paul the Apostle, a convert to the Faith as a result of the prayers offered at his death and from eternity by Saint Stephen the Protomartyr, planted the seeds that would result in the rise of the Empire of Christ the King that made its headquarters in Rome. Neither Saint Peter or Saint Paul, however, lived to see the glories of Christendom with the eyes of their bodies. They saw these glories from Heaven. They did the work of Apostles without regard for results. According to Saint Alphonsus de Liguori, thirteen million Catholics were put to death by the brute force of the civil authorities of the pagan Roman Empire between the time of the Emperor Nero's persecution in the year 67 A.D. and the Edict of Milan issued by the Emperor Constantine in the year 313 A.D. These Catholics did not look for results. They simply wanted to be faithful to the Deposit of Faith that had been entrusted by Our Blessed Lord and Saviour Jesus Christ exclusively to the infallible teaching authority of the true Church that He founded upon the Rock of Peter, the Pope. These martyrs, among whose ranks are to be found Saint Bibiana, whose feast we commemorated yesterday, Sunday, December 2, 2012, the First Sunday of Advent, Saint Barbara, whose feast is commemorated tomorrow, Tuesday, December 4, 2012, and our dear Saint Lucy, whose feast is celebrated on Thursday, December 13, 2012, would not burn even one grain of incense to the false gods. Not one single grain of incense. None of the Catholic missionaries who sought to convert various barbaric tribes an pagan peoples in Europe and North Africa and the Near East in Asia Minor and India compromised the Faith even a little bit. They were faithful to Christ the King without looking for results. Saint Patrick did not engage the Druids in "inter-religious dialogue" on the Emerald Isle, Ireland. It can mean death," he [Martin] thought. "Even I know that the Russian pagans are little more than crude barbarians." Countless are the number of times in which the demon worship that these great Catholic missionaries sought to eradicate from the face of this earth have been incorporated into "offerings" of the Protestant and Masonic Novus Ordo service, sometimes with the full participation of the conciliar "pontiffs," especially Karol Wojtyla/John Paul II, Joseph Ratzinger/Benedict XVI and, of course, the lay Jesuit himself, Jorge Mario Bergoglio, currently masquerading as "Pope Francis." The demon worship known as Hinduism has been offered the Chapel of the Apparitions in the Shrine of the Most Holy Trinity in Fatima, Portugal (May 5, 2004). and in many other Catholic venues in their conciliar captivity. 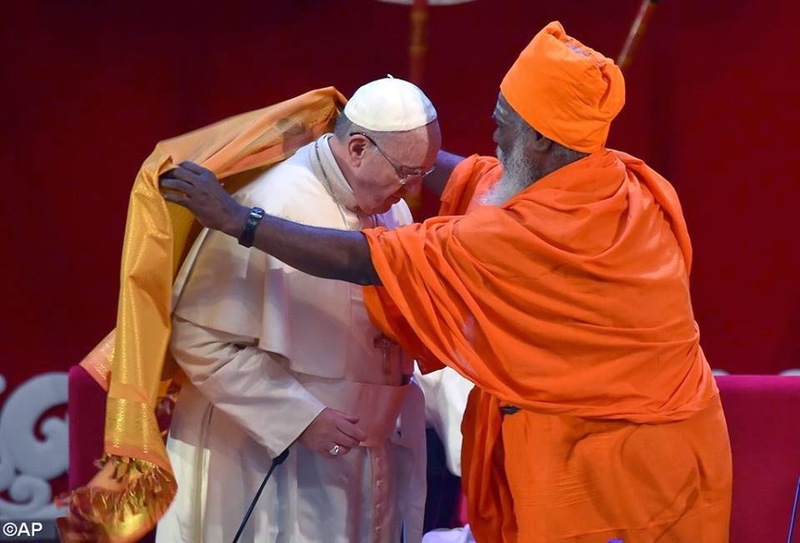 As the post on Call Me Jorge on which the photograph above may be found, Bergoglio also paid an impromptu visit to a Buddhist temple on the way back from a Marian shrine in Sri Lanka. So much idolatry, so little time. If any man speak, let him speak, as the words of God. If any man minister, let him do it, as of the power, which God administereth: that in all things God may be honoured through Jesus Christ: to whom is glory and empire for ever and ever. Amen. Dearly beloved, think not strange the burning heat which is to try you, as if some new thing happened to you; But if you partake of the sufferings of Christ, rejoice that when his glory shall be revealed, you may also be glad with exceeding joy. If you be reproached for the name of Christ, you shall be blessed: for that which is of the honour, glory, and power of God, and that which is his Spirit, resteth upon you. But let none of you suffer as a murderer, or a thief, or a railer, or a coveter of other men's things. As the conciliar popes, including Bergoglio, have demonstrated so amply, idolatry in the name of “respecting” religious traditions is a well-enshrined principle of the counterfeit church of conciliarism. There is, of course, an exception to this. The conciliar officials do not respect the religious traditions of Catholicism. Various Catholic churches in conciliar captivity have been desecrated by "worship" rendered to the demons of false religions. Countless are the blasphemies and sacrileges and abominations committed in the name of the Catholic Church by the conciliar revolutionaries that make a mockery of the courage of the millions of Catholic martyrs who gave up their lives rather than even to give the appearance of committing such acts against the honor and majesty and glory of God. Indeed, the conciliar blasphemies and sacrileges and abominations, some of them committed most openly by the conciliar "pontiffs" themselves, have been so commonplace that many ordinary Catholics in the conciliar structures, assaulted on a daily basis by the abomination that is the Novus Ordo service, have lost all sense of outrage for the honor and majesty and glory of God while some of those who do indeed know better, especially in the Motu "clergy," keep their mouths shut out of fear of offending the apostates who commit these actions against God. As has been noted on this site frequently (see Hunkered Down on Mindanao from many years ago now), efforts of some very well-intentioned "conservative" Catholics yet attached to the conciliar structures to oppose the garden-variety blasphemies and sacrileges at the parish and diocesan levels are in vain as the conciliar "pontiffs" themselves have provided all of the precedents necessary to make acts that any sensible Catholic knows is offensive to God to become an institutionalized part of life in the conciliar structures. Mohammedanism is a false religion that is based on a rejection of the doctrine of the Most Blessed Trinity and of the Sacred Divinity of the Second Person of the Most Blessed Trinity made Incarnate in the Virginal and Immaculate Womb of His Most Blessed Mother by the power of the Third Person of the Most Blessed Trinity, God the Holy Ghost. It is conceived in the man of a lustful, bloodthirsty man who wanted to create a Pan-Arabic movement. The false prophet Mohammed saw to it that his false religion spread by the force of the sword over Arabia as great centers of Catholicism in Egypt and Libya were overrun by his murderous followers. Jorge Mario Bergoglio ignores the fact that Mohammedanism attempted to spread into France as early as the year 732 A.D., after the Moors had taken hold in large parts of the Iberian Peninsula twenty-one years before, and that they were successful in penetrating the Balkans, especially in Kosovo, Bosnia-Herzegovina, and Albania during the Ottoman invasions. Bergoglio lives in a fantasy world of theology and history that parallels the universe inhabited by his ideological soulmate, Barack Hussein Obama/Barry Soetoro. Thank you. You have shown many signs of respect and friendship towards Muslims. I am wondering: what do Islam and the teachings of the Prophet Muhammad have to say to today’s world? What kind of “values” do the Mohammedans have? The cutting off of the hands of thieves and the stoning of other criminals. A history of the killing of Christians and of the destruction of Christian churches and shrines. Various attempts to invade Europe in the Second Millennium. In order to get rid of them, Pope John VIII decided in 878 to promise them an annual payment of several thousand gold pieces; but this tribute of the Holy See to Islam seems to have been paid for only two years; and from time to time until the beginning of the tenth century, the Muslims reappeared at the mouth of the Tiber or along the coast nearby. Marseilles, for its part, was also hit; in 838 the Arabs landed there and devastated it; Saint Victor’s Abbey, outside the walls was destroyed, and many inhabitants of the city were carried off in captivity; ten years later a new raid occurred, the Old Port was again sacked. And this perhaps was repeated more around the year 920. The whole Italian peninsula was similarly exposed: around 840 Muslim ships followed the Adriatic coasts as far as the Dalmatian archipelago and the mouth of the Po River. Then returning south, they dared to attack a city, Ancona, some two hundred kilometers northwest of Rome; a sort of commando dashed ashore; the city was devastated and set on fire. During this conquest of Sicily, when they took Syracuse in 878, after a deadly attack, they were exasperated by the resistance that they met with. When they rushed into the city, they found along their way the Church of the Holy Savior, filled with women and children, and they massacred them all. Then, spreading out through the city, they continued the slaughter and the pillage, had the treasure of the cathedral handed over to them; they also took many prisoners and gathered separately those who were armed. One week later all of the captives who had dared to fight against them were butchered (four thousand in number, according to the chronicle of Bayyan). In 934 or 935, they landed at the other end of Italy, at Genoa, killed “all the men they found there, and then left again, loading onto their ships “the treasures of the city and of its churches.” A few years later they settled for a time, it seems, in Nice, Frejus, Toulon. The likes of Jorge Mario Bergoglio would have us believe that Mohammedans who blow up churches, desecrate Christian shrines, and who kidnap, assault, torture and massacre innocent human beings are “perverting” a “religion of peace.” This is a lie from men who are steeped in delusions, which they keep reassuring themselves over and over again as they call for “dialogue” and “encounter” as “respect” is shown to a false, blasphemous religion that is based on a rejection of the doctrine of the Most Holy Trinity. The Mohammedans also attacked Venice, Italy, one hundred eighty-four years later as the Ottoman leader Murad II laid siege to Venice in 1423. A true Successor of Saint Peter, Pope Saint Martin V, inveighed the Christian princes of Europe to band together to come to the aid of the Venetians. Mohammedans also attempted to invade Italy and then strike directly at Rome in the Battle of Lepanto on October 7, 1571, a victory secured by Pope Saint Pius X’s calling upon Catholics to pray Our Lady’s Most Holy Rosary. The saint whose feast was celebrated two days ago, Saint Francis Xavier, S.J., gave no quarter to false religions. Unlike the lay Jesuit named Jorge Mario Bergoglio, Saint Francis Xavier sought to stamp out idolatry and to convert adherents of false religions, each of which he knew to be hateful in the sight of the true God of Divine Revelation, the Most Blessed Trinity. The apostles being heralds of the coming of the Messias, it was fitting that Advent should have in its calendar the name of some one among them. Divine Providence has provided for this; for, to say something of St. Andrew, whose feast if oftentimes past before the season of Advent has commenced, St. Thomas’s day is unfailingly kept immediately before Christmas. We will explain, later on, why St. Thomas hold that position rather than any other apostle; at present, we simply assert the fitness of there being at least one of the apostolic college, who should announce to us, in this period of the Catholic cycle, the coming of the Redeemer. But God has not wished that the first apostolate should be the only one to appear on the first pages of the liturgical calendar; great also, though in a lower degree, is the glory of that second apostolate, whereby the bride of Jesus Christ multiplies her children, even in her fruitful old age, as the psalmist expresses it. There are Gentiles who have still to be evangelized; the coming of the Messias is far from having been announced to all nations. Now of all the valiant messengers of the divine Word who have, during the last few hundred years, proclaimed the good tidings among infidel nations there is not one whose glory is greater, who has worked greater wonders, or who has shown himself a closer imitator of the first apostles, than the modern apostle of the Indies, St. Francis Xavier. The life and apostolate of this wonderful man were a great triumph for our mother the holy Catholic Church; for St. Francis came just at a period when heresy, encouraged by false learning, by political intrigues, by covetousness, and by all the wicked passions of the human heart, seemed on the eve of victory. Emboldened by all these, the enemy of God spoke, with the deepest contempt, of that ancient Church which rested on the promises of Jesus Christ; it declared that she was unworthy of the confidence of men, and dared even to call her the harlot of Babylon, as though the vices of her children could taint the piety of the mother. God’s time came at last, and He showed Himself in His power; the garden of the Church suddenly appeared rich in the most admirable fruits of sanctity. Heroes and heroines issued from that apparent barrenness; and whilst the pretended reformers showed themselves to be the most wicked of men, two countries, Italy and Spain, gave to the world the most magnificent saints. We are living at time that is nearly five hundred years distant from the beginnings of the Protestant Revolution. Indeed, we walk among the ruins of that revolution every day of our lives. Each of us, I am sure, meets Protestants, many of whom are not legitimately baptized (that is, that those who are “baptized in the name of the Lord Jesus,” not “In the Name of the Father, and of the Son, and of the Holy Ghost”) and thus are pagans even though they do not realize that they are, who are clueless about First and Last Things. Moreover, each of us, I am sure, meets baptized Catholics who are equally clueless about First and Last Things, an ignorance that has been aided and abetted by the conciliar revolutionaries, who are themselves walking amidst the ruins of their own failed and failing revolution that was founded upon the crumbled stones of the remains of Protestantism and Judeo-Masonry. Francis was of noble family, and was born in the castle of Xavier, in the diocese of Pampeluna, in the year of our Lord 1506. He was a companion of St. Ignatius at Paris, and one of his earliest disciples. Under his teaching, he learnt to become so wrapt in the contemplation of divine things, that he was sometimes lifted in ecstasy off the ground, which happened to him several times when he was saying Mass in public before large congregations. He earned these refreshments of the soul by the sharpest punishment of the body. He gave up the use not only of meat and wine, but also of wheaten bread; he lived on the vilest food, and ate only once every two or three days. He used an iron scourge till his blood ran freely; he shortened the hours of his rest, and lay only on the ground. The hardness and holiness of his life had made him meet to be called to be an Apostle, and when John III, King of Portugal, asked Pope Paul III to send to the Indies some members of the then new Society of Jesus, the Pontiff, by the advice of St Ignatius, sent Francis to enter on that vast field of labour with the powers of Apostolic Nuncio. He arrived (in India on the 6th day of May, in the year 1542.) When he began his work, it seemed as though God Himself taught him the many and difficult languages of the natives. It even happened that when he preached in one language to a mixed congregation of different nationalities, each one heard him in his own tongue wherein he was born. He travelled over countless districts, always walking, and often bare-footed. He introduced the faith into Japan, and six other countries. In India he turned many hundred thousands to Christ, and regenerated many chiefs and kings in the holy font. And notwithstanding that he was doing all these great things for God's service, so deep was his lowliness that when he wrote to St. Ignatius, the General of the Society, he did so on his knees. Yes, the saint whose feast we celebrate today, Saturday, December 3, 2016, Saint Francis Xavier, S.J., gave no quarter to false religions. Unlike the lay Jesuit named Jorge Mario Bergoglio, Saint Francis Xavier sought to stamp out idolatry and to convert adherents of false religions, each of which he knew to be hateful in the sight of the true God of Divine Revelation, the Most Blessed Trinity. Saint Francis Xavier had great zeal to seek the unconditional conversion of the souls of non-Catholics to the maternal bosom of the true Church, outside of which there is no salvation, no matter the obstacles he faced and no matter the results. Although he won many converts in Goa, India, this early companion and one of the original priests of the Society of Jesus walked barefoot in the snow in Japan to plant the seeds for the conversion of at least a few souls. Saint Francis Xavier wanted to be faithful without looking for the same results in Japan as he had realized in India by the graces won for us on Calvary by the shedding of every single drop of Our Blessed Lord and Saviour Jesus Christ's Most Precious Blood and that flow into our hearts and souls through the loving hands of Our Lady, the Mediatrix of All Graces. He would only see the results of his wonderful labors in Japan from eternity. Saint Francis Xavier sought only the conversion of the Japanese people, knowing that Our Lord had died for them as He had died for all other men. He had true love for souls, a love that was not a mere expression of human sentimentality but an act of his will in perfect conformity with the very Will of God, Who loves all men in that He wills their good, the ultimate expression of which is the salvation of their immortal souls as members of the Catholic Church. There is in the city of Kyoto today a painting which shows Francis Xavier arriving in the capital of Japan. It pictures him running barefoot in the snow behind the sedan chair of a nobleman. Behind him in the snow he has left footprints colored red with his blood. His clothes are tattered and he appears starving, but on his face is a look of peace and great joy. The painting sums up what Francis went through to reach Kyoto, and the great hopes he brought there with him. The first part of the journey from Yamaguchi to Kyoto had to be made over rough roads. Francis and his friends covered forty miles to reach the port of Iwakuni. Snow drifts came up to their knees. They had to cross freezing mountain torrents that were waist deep. The region was full of unfriendly samurai who at any moment might wish to test their swords on the missioners. Children chased them, throwing stones. Their clothes became so tattered that innkeepers refused them shelter. Often they could obtain no food and had to munch a bit of dry rice which they carried with them. At Sakai, no inn would accept them, and they had to build a crude hut on a mountainside to escape the cold driving rain and snow. The travelers had to remain some time at Sakai, because a small war was being fought between there and Kyoto. While at Sakai children tormented them, and they were unable to preach. Adults too poked fun at the ragged strangers. One young man called Francis a fool and a stupid beast. "Why do you speak to me in this way?" Francis asked. "I love you very much and I would greatly like to teach you the way of salvation." But the young man laughed at Francis' kindness, and kept on mocking him. Finally the travelers were permitted to join a nobleman who was going to the capital. This man allowed them to follow his part as his servants did. He also insisted that Francis, Brother Fernandez and Bernard carry some of his baggage on their backs. It was a hard journey because the servants who carried the sedan chair in which the nobleman rode moved at a brisk trot. Francis and his friends had to run to keep up with the nobleman. The painting in Kyoto shows the end of this part of the journey. It was with a happy heart that Francis entered Kyoto. Here was the end of his trail. Here he would see the emperor of all Japan and get permission to preach over the whole country. Then came the great disappointment. Once in the city, Francis saw that great areas had been burnt out and destroyed in the war that was going on. The temples were badly in need of repair. Every attempt to see the emperor failed, and after Francis learned that even the Emperor's own people did not obey him, he stopped trying to see the man. Because of the war, the people were not interested in listening to the teachings of Christ. There were a few attempts at preaching, but they were not successful. Only a handful of converts were made. Francis remained only eleven days in Kyoto--eleven days of bitter disappointment. Then realizing that because of the war nothing could be done in the city, he decided to return to Yamaguchi. On the face of things, it would appear that Francis Xavier had failed. But he had not. The seed of religion which he had planted in Kyoto in his brief visit there would blossom into a rich harvest. Only a dozen years later, Kyoto would boast many, many Christians. From this city came some of the greatest martyrs the Church has ever produced. In order not to travel overland and risk the many dangers, the part left Kyoto by boat. The journey in a small boat in freezing weather was from from pleasant. When they reached Osaka, they took passage on another boat to Sakai. Finally they were back to Hirado, their starting point four or five months later. Their hardships were greatest on their return journey. It was February, the time of snow, sleet, and wind. The missioners had neither rest nor shelter. Francis would buy dry fruits at the inns and carry them in his sleeves. Then when he came across children by the roadside, he would give them some of the fruit and his blessing. Once safe in Hirado, Francis thought over the whole unhappy journey he had just finished. He felt that it had been a failure. He had been hooted at and stoned. He had not been well received by the daimyos or the emperor. No one had been impressed with the missioners. Perhaps it was because they looked so shabby. Perhaps if they were dressed as ambassadors--ambassadors of God--they would be better received. Once again Francis' high spirits came back to him. At once he began making plans to return to Yamaguchi and visit the powerful daimyo there. This time he would impress the ruler. Francis ordered a new kimono for himself and one for Brother Fernandez. He had them made of the best silk. He and Brother Fernandez had once been dandies, dressing in the best style. He would show the daimyo that he knew how to dress! Kimonos were also ordered for Bernard and another Japanese Christian. They were given swords and daggers to wear, as was the custom among the rich people. The Indian boy, Amador, was dressed in the finest silks, which made his dark skin shine even brighter. Even then Francis was not finished. Opening the many presents he had brought from India and which had rested all this time in the care of Father Torres, he chose the ones he thought would make the best impression. Then he finally wrapped up in silk two letters he had never used--one from the governor of India; the other from the Bishop of Goa. This time Francis traveled in the style that befit an ambassador. He hired horses for his friends, and for himself a sedan chair. He entered Yamaguchi with great pomp. The daimyo, who heard of his impressive approach, at once invited him to his palace. Francis greeted the daimyo, never mentioning the reprimand he had Brother Fernandez deliver on his last visit. He presented his friends to the Japanese ruler. Then he gave the daimyo his gifts. They included a music box, a glass mirror, a three-barreled rifle, yards of the best cloth, books, vases, paintings, barrels of port wine, and a grandfather clock. The daimyo was thrilled by the gifts, particularly by the lock which sounded chimes whenever it reached the hour. The daimyo wanted to give Francis a large gift of money in return, but the missioner wisely refused the present. He asked only that he and his friends be allowed to preach and baptize. The daimyo agreed at once. He ordered his assistants to prepare a large empty monastery which he turned over to Francis to use as long as he remained in Yamaguchi. He also ordered a notice to be written and put up around the city. It said: "I am pleased to allow that the Law of God may be taught and preached throughout my lands and that those who wish to convert may do so freely. My servants are all forbidden to hinder any of the Fathers who preach this Law." Francis' plan had proved a great success. If Japan was not to be won one way, another would do! At first the work in Yamaguchi went slowly. One day when Brother Fernandez was preaching in the street, surrounded by a large crowd, a rough looking fellow began to make fun of him. When Brother Fernandez did not notice him, the man spat in Brother's face, the worse insult that could be offered to a Spanish gentleman. Brother Fernandez did not pause in his sermon, nor did he show any anger. He simply wiped the spittle off as he went on talking. A man in the crowd, hostile to the Christians, watched what had happened. When he saw how Brother Fernandez acted, he suddenly realized that here was a man who practiced what he preached. As soon as the sermon ended, he followed Francis and Brother to their monastery and asked to be prepared for baptism. He was the first convert in Yamaguchi. From that time on converts came in dozens. In the first two months after the incident five hundred people were taught and baptized. All of the missioners were busy every day teaching. Twice a day large crowds came to the monastery to hear Brother Fernandez explain the Law of God, and among the visitors were many Buddhist monks and nuns, some of whom became converts. On another day, when the missioners were preaching in the street, a minstrel, who went from house to house among the rich, entertaining with song and story, was in the crowd. Impressed with what he heard, he approached Francis and said that he wanted to leave behind his stories and songs and violin, and work only to serve God. Francis taught this minstrel, who was blind in one eye and nearly so in the other, and baptized him with the name Lawrence. Lawrence became the first Brother in Japan of the Society of Jesus. This poor, misshapen man was the greatest convert Francis Xavier ever made. Lawrence debated with the most learned Buddhist monks, and he always defeated them. The power of his teaching was so great that even the most learned men in Japan humbled themselves at his feet. He made thousands of converts, and he was the missioner who went to Kyoto and began the movement there towards the Church. Once when Brother Lawrence was preaching in a Buddhist monastery to three hundred samurai, he badly defeated a monk who tried to debate with him. The man grabbed a sword, and rushed at Brother shouting, "I'll show you how immortal your soul is!" The maddened monk was held back by others. Brother Lawrence faced many such dangers, but he never weakened in his work. He lived a very holy life, and died at an old age in Nagasaki. The Christian Faith was growing well in Yamaguchi, when one day a letter reached Francis from the daimyo of Bungo, inviting the missioner to come there to preach Christianity. It was a wonderful chance to win more souls. Francis took with him three of his Japanese converts--Bernard, John and Matthew--and left at once for Bungo. Father Torres was placed in charge of the work at Yamaguchi, and Brother Fernandez was left behind to help him. When Francis reached a port on the seacoast, he found a Portuguese ship riding at anchor. It was a pleasure for him to see and talk with men from Europe. He was soon busy hearing confessions and saying Mass for the Portuguese sailors. The captain of the ship, Duarte de Gama, was an old friend of Francis, and this man offered to take Francis to the city where the daimyo of Bungo lived. Francis arrived in Bungo in great style. He saw the daimyo and was received kindly. The daimyo told him that he cold preach Christianity to the people. Francis was happy at this permission, but he was worried because the Portuguese ship had brought no mail or news of the Jesuits in Europe. Francis had written shortly after arriving in Japan, asking for more helpers, and so far not a single word had come about them. Francis decided that he must travel back to India and learn what had happened. The presence of the Portuguese boat was heaven-sent, because the boat could take him part way back to India. Once he he had settled he is business there, he would return to Japan. The whole trip should take less than a year. He sent Father Torres money to carry on the work in Yamaguchi. Then he boarded the Portuguese vessel. Saint Francis Xavier, who had been born to a noble family in Navarre, Spain, on April 7, 1506, was not to return to Japan again after he left in 1551. He was welcomed back in Goa, India, with great enthusiasm by the Catholic converts he had made there before his journey to Japan. Saint Francis, who meet Saint Ignatius of Loyola when they were students at the University of Paris and was convinced by his future Father-General to give up his life of partying and pretense, had distinguished himself in Goa for seeking the unconditional conversion of souls there--and for his unstinting zeal for the honor and glory and majesty of God in smashing to smithereens the symbols of false religions that have been esteemed by Jorge Mario Bergoglio and his predecessr, Joseph Ratzinger/Benedict XVI and, of course, by Karol Wojtyla/John Paul II. May the grace and love of Christ our Lord always help and favor us ! Amen. . . . Now to speak of what I know you are most anxious to hear about the state of religion in India. In this region of Travancore, where I now am, God has drawn very many to the faith of His Son Jesus Christ. In the space of one month I made Christians of more than ten thousand. This is the method I followed. As soon as I arrived in any heathen village where they had sent for me to give them baptism, I gave orders for all, men, women, and children, to be collected in one place. Then, beginning with the first elements of the Christian faith, I taught them there is one God, Father, Son, and Holy Ghost; and at the same time, calling on the three divine Persons and one God, I made them each make three times the sign of the Cross; then, putting on a surplice, I began to recite in a loud voice and in their own language the form of the general Confession, the Apostle's Creed, the Ten Commandments, the Lord's Prayer, the Ave Maria, and the Salve Regina. Two years ago I translated all these prayers into the language of the country, and learned them by heart. I recited them slowly so that all of every age and condition followed me in them. Then I began to explain shortly the articles of the Creed and the Ten Commandments in the language of the country. Where the people appeared to me sufficiently instructed to receive baptism, I ordered them all to ask God's pardon publicly for the sins of their past life, and to do this with a loud voice and in the presence of their neighbors still hostile to the Christian religion, in order to touch the hearts of the heathen and confirm the faith of the good. All the heathen are filled with admiration at the holiness of the law of God, and express the greatest shame at having lived so long in ignorance of the true God. They willingly hear about the mysteries and rules of the Christian religion, and treat me, poor sinner as I am, with the greatest respect. Many, however, put away from them with hardness of heart the truth which they well know. And now what ought you to do when you see the minds of these people so well prepared to receive the seed of the Gospel? May God make known to you His most holy will, and give you at the same time strength and courage to carry it out; and may He in His Providence send as many as possible of you into this country! From Cochin, January 27th, 1545. May the grace and love of Jesus Christ our Lord always help and favor us! Amen. . . .
. . . Nearly two hundred miles beyond Molucca there is a region which is called Maurica. Here, many years ago, a great number of the inhabitants became Christians, but having been totally neglected and left, as it were, orphans by the death of the priests who taught them, they have returned to their former barbarous and savage state. It is in every way a land full of perils, and especially to be dreaded by strangers on account of the great ferocity of the natives and the many kinds of poison which it is there common to give in what is eaten and drunk. The fear of this has deterred priests from abroad from going there to help the islanders. I have considered in what great necessity they are, with no one to instruct them or give them the sacraments, and I have come to think that I ought to provide for their salvation even at the risk of my life. I have resolved to go thither as soon as possible, and to offer my life to the risk. Truly I have put all my trust in God, and I wish as much as is in me to obey the precept of our Lord Jesus Christ: "He that will save his life shall lose it; and he that shall lose his life for My sake shall find it." Words easy in thought but not easy in practice. When the hour comes when life must be lost that you may find it in God, when danger of death is on you, and you see plainly that to obey God you must sacrifice life, then, I know not how, it comes to pass that what before seemed a very clear precept is involved in incredible darkness.... It is in such circumstances that we see clearly how great after all our weakness is, how frail and unstable is our human nature here. Saint Francis worked as a Catholic, not as a conciliar revolutionary who believes that the Catholic Church and false religions that worship the devil must "peacefully coexist." Saint Francis worked as a Catholic, not as a conciliar revolutionary who believes that the Catholic Church and false religions that worship the devil must "peacefully coexist." He was the sort of Catholic "fundamentalist" who was disparaged by Jorge Mario Bergoglio in his interview five daysa go now. I stand with the "fundamentalism" of Saint Francis of Assisi. What about you? Not until December [of 1553] did a ship sail for India, so Saint Francis was well over a year dead when his perfectly preserved body reached Goa. Once again an entire city turned out to honor the memory of the missioner. Never before or since was there anything like the sadness which swept over Goa. The Dominican priest who preached at the funeral could not be heard for the sobbing in the huge cathedral. Finally, his own tears forced him to leave the pulpit. A Jesuit who had known Saint Francis Xavier has left us a description of the body as it appeared a year and half after death. This is what he wrote: "He looked exactly as we remembered him, lying there in his priestly robes as if he had died only a half hour ago. Under the vestments, next to the skin, the body was clothed in a rich robe which the Father had taken with him to Goa to wear for his meeting with the emperor of China. Though it had been more than a year under the earth, it was so clean and fresh that Father Nunes was able to wear it later when he paid visits to the kings of Japan." Doctors were called to examine the body of the saint and to find out whether or not it had been embalmed. The doctors examined the body very carefully and declared that it had not been preserved by "any natural or artificial means." There was no other conclusion but that God had worked a great miracle in behalf of Saint Francis Xavier. For four days, from dawn until midnight, crowds passed through the cathedral to see the body and kiss the feet of the saint who had journeyed so far for God. Then the body was placed in a special shrine especially built for it. From time to time the shrine was opened, and the body shown to the people. But each time the appearance of the body caused so much excitement among the people that the officials thought it best that the tomb be closed again. One hundred and forty years after the body was placed in the tomb, it was brought out so that an important bishop might see it. Present on that day was a French Jesuit. He writes that the body was in a perfect state, and he also gives a good description of Saint Francis Xavier. "The Saint's hair is black and slightly curling," he wrote. "The forehead is broad and high, with two rather large veins, soft and of a purple tint, running down the middle, as is often seem in talented persons who spend much time in deep thought. The eyes are black, lively, and sweet, with so keen a glance that he would seem to be alive and breathing. The lips are of a warm reddish color and the beard is thick. "In the cheeks there is a pale purple tint. The tongue is quite flexible, red, and moist, and the chin is beautifully shaped. In a world the body has all the appearances of a living man. It is so great a marvel, that on seeing it, while I was present, the Commissioner of the Dutch East India Company became at once a convert to the Catholic Faith." Not only after this, the body began to darken and dry up. When it was photographed in 1932, it had become mummified. Only a very hard-hearted Catholic could refrain from getting a little misty-eyed over the story of the Dutch Calvinist's conversion to the Catholic Faith as a result of seeing the then incorrupt body of Saint Francis Xavier one hundred forty years after the Saint's death. And the great esteem shown this true Catholic missionary by the people of Goa demonstrates that souls liberated by Baptism from their captivity to the devil by means of Original Sin and their participation in false religions remain supremely grateful to the priest responsible for giving new birth to their soul and giving them access to the Sacred Tribunal of Penance and to the worthy reception of the God-Man, Our Blessed Lord and Saviour Jesus Christ, in Holy Communion. Saint Francis Xavier, who was canonized by Pope Gregory XV on March 12, 1622, along with Saint Ignatius of Loyola, Saint Teresa of Avila and Saint Philip Neri, mirrored his mentor and companion Saint Ignatius Loyola's great love for Our Lady. It was to the Mother of God that Saint Francis Xavier entrusted all of his missionary work to effect the conversion of pagan peoples to the true Faith as he prayed Our Lady's Most Holy Rosary on a daily basis. We may never get to travel to distant lands to serve as missionaries. Each of us, however, can be a spiritual missionary, if you will, by praying as many Rosaries each day as the duties of our states-in-life permit, attempting also to distribute blessed Green Scapulars and blessed Miraculous Medals to those whom God's Holy Providence places in our paths each day. We desire the possession of Heaven for ourselves. We desire it also for all others on the face of this earth as each person is made in the image and likeness of the Most Blessed Trinity and has been redeemed by the shedding of the Most Precious Blood of the Second Person of the Most Blessed Trinity, Our Blessed Lord and Saviour Jesus Christ, made Incarnate by the power of the Third Person of the Most Blessed Trinity, God the Holy Ghost, in the Virginal and Immaculate Womb of Our Lady. May Saint Francis Xavier help us to have a holy zeal for souls and a holy zeal for the honor and glory and majesty of God as we reject everything to do with the false religion of conciliarism and with its spiritual robber baron "popes" and "bishops" who do indeed esteem the devil's religions and reaffirm people in falsehoods that could indeed wind up sending them to Hell for all eternity. Glorious apostle of Jesus Christ, who didst impart His divine light to the nations that were sitting in the shadows of death ! we, though unworthy of the name of Christians, address our prayers to thee, that by the charity which led thee to sacrifice everything for the conversion of souls, thou wouldst deign to prepare us for the visit of the Saviour, whom our faith and our love desire. Thou wert the father of infidel nations; be the protector, during this holy season, of them that believe in Jesus Christ. Before thy eyes had contemplated the Lord Jesus, thou didst make Him known to countless people; now that thou seest Him face to face, obtain for us that, when He is come, we may see Him with that simple and ardent faith of the Magi, those glorious first-fruits of the nations to which thou didst bear the admirable light. Remember also, O great apostle, those nations which thou didst evangelize, and where now, by a terrible judgement of God, the word of life has ceased to bring forth fruit. Pray for the vast empire of China, on which thou didst look when dying, but which was not blessed with thy preaching. Pray for Japan, thy dear garden which has been laid waste by the savage wild beast, of which the psalmist speaks. May the blood of the martyrs which was poured out on that land like water, bring it the long-expected fertility. Bless, too, all the missions which our holy mother the Church has undertaken in those lands where the cross has not yet triumphed. May the heart of the infidel be opened to the grand simplicity and light of faith; may the seed bring forth fruit a hundred-fold; may the number of thy successors in the new apostolate ever increase; may their zeal and charity fail not; may their toil receive its reward of abundant fruit; and may the crown of martyrdom, which they receive, be not only the recompense but the perfection and the triumph of their apostolic ministry. Recommend to our Lord the innumerable members of that Association, which is the means of the faith being propagated through the world, and which has thee for its patron. Pray, with a filial affection and earnestness, for that holy Society, of which thou art so bright an ornament, and which reposes on thee its firmest confidence. May it more and more flourish under the storm of trial which never leaves it at rest; may it be multiplied, that so the children of God may be multiplied by its labours; may it ever have ready, for the service of the Christian world, zealous apostles and doctors; may it not be in vain that it bears the name of Jesus. Dom Prosper Gueranger’s prayer is both an accurate description of the times in which he lived and, of course, of the state of the world today, including the fact that those who belong to the Society of Jesus in its conciliar captivity at the present time do indeed bear the name of this venerable agent of the Catholic Counter-Reformation entirely in vain. His prayer is also an exhortation to inspire us to maintain the Supernatural Virtue of Hope in the midst of the darkness that envelops us at this. Christ the Light is to break upon us in twenty-two days! May Saint Francis Xavier inspire us to put away our own works of darkness by making a good Confession frequently, if possible, during this Advent, and to offer up our daily prayers, works, suffers and tribulations as the consecrated slaves of Our Blessed Lord and Saviour Jesus Christ through the Sorrowful and Immaculate Heart of Mary, especially by many as many Rosaries each day as our state-in-life permits. Saint Ignatius Loyola, S.J., pray for us.